Volkswagen released information on a new Performance Passat Concept ahead of NAIAS that will be a preview of a new upcoming 2014 Passat sport sedan. Volkswagen has announced the global debut of the new Performance Passat Concept that will be officially unveiled at the North American International Auto Show in Detroit next week. Volkswagen will be taking the Passat which had its best year of sales, and will be giving it a new attitude with a bump in performance and new styling. Volkswagen says this Performance Concept Passat will give us a sneak peak at a new upcoming 2014 Passat sport sedan. The Performance Concept features a new performance 1.8-liter turbocharged engine, new headlamps and new styling inside and out. The most notable new feature on the Passat Performance Concept is the all-new 1.8-liter turbocharged and direct-injected TSI four-cylinder engine. The engine is a modification of VW’s popular EA888 which is already powering a number of cars in Europe and Asia. But it looks like the new upcoming Passat sport sedan will get a modified version which will deliver 250 horsepower from the new turbocharged four-cylinder. This is a considerable bump in hp from the current engine that powers the VW Jetta and VW Passat. It will transfer all that power to the wheels via a six-speed automatic transmission. It will also feature a lowered sport suspension and electro-mechanical steering to enhance handling in the curves. The Volkswagen EA888, or “Triple 8,” has been in production in Europe and Asia since spring 2012. It will also be used in the 2013 2.0-liter TSI Volkswagen and Audi powertrains. Volkswagen has said in the past that the new 1.8-liter engine would be available in 2014 models. 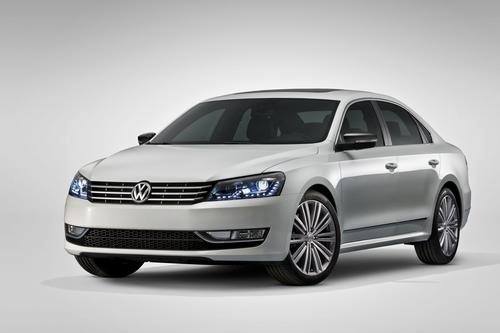 It’s very likely that we will see the new VW Passat sport sedan as a 2014 model. The U.S. version of the Triple 8 will be built at a new $300 million factory in Silao, Mexico, where some pre-production units already have rolled off the line. The new engine will be used globally and will meet future emissions regulations in all markets. The Passat Performance Concept will set itself apart from the regular Passat with some other features like dual exhaust, 19-inch “Luxor” alloy wheels, Bi-Xenon headlights including Advanced Front Lighting System (AFS) and LED taillights and carbon applications on its mirror caps. Inside the cabin, the performance model will have carbon-like touches that dominate the dashboard, matching the carbon-style inserts on two-color leather seating surfaces and complementing the black headliner and side pillars. The new Passat Performance Concept gives us a good idea of what the all-new 2014 Passat sport sedan is likely to look like. The new 250 horsepower turbocharged engine coupled with a six-speed sport gearbox with sport suspension will give the new sport sedan just what it needs to take on the curves. The CC version of this might be worth checking out closely. Don't know what it is about those small blown 4s from VW, but they perform above their HP class. Maybe it is the dual clutch trannies. Interesting that they are back to 1.8 where the turbo 4s started at VW in US cars. Anything but that 2.5 normally aspirated boat anchor. VW doesn't get it. Check every successful car design and then look at VW. How bland can you be? I can understand why vw only has a mere 1% or less in the mkt place.